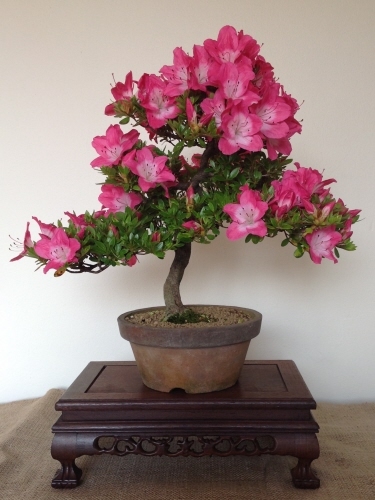 This is a fantastic informal upright Satsuki Azalea bonsai tree that needs to be kept outside all year round. This years dark pink flowers have already started to open out. Keeping up humidity is very important as U.K. summers are usually a lot drier than in Japan, so Keeping this tree in a sheltered spot next to a pond or in close proximity to other bonsai trees will insure the tree does well throughout the growing season, misting now and again can also help (not when in flower!) This tree is frost hardy so not much need for any protection during the coldest months. A nice sheltered spot in the garden will do just fine. Just make sure the soil doesn't stay too wet during the coldest months. One mistake people often make is putting the tree in a greenhouse or shed during the winter months. These are very dry environments so should be avoided with Azaleas. Expect to loose some leaves during the winter months. Please note the tree might not be in flower when you receive the tree. If pruned in the correct way it will flower again next season. With a bit of work and time the foliage pads on this tree will improve further and you will have a top quality very sort after bonsai tree. This tree sits about 13 inches above its training pot and is about 15 inches wide. The pot is 7.5 inches wide and 3.5 deep. A short walk around video of the above tree. The video was taken in August 2017. - This is an evergreen bonsai meaning it doesn't shed all of its leaves during the winter months. It May loose a few.